There has been a lot of activity in recent months on the already prolific Benetti Vision series. Firstly, hull BV14 (the 13th of the series) was delivered in mid-February. The yacht has been named Vica. Secondly, hull BV15 (the 14th of the series) was launched at the end of April. Now called My Sisa, she recently finished her sea trials and should be delivered very soon. 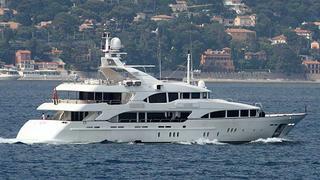 With a length of 44.2m, this semi-custom series was designed by Stefano Righini. Built in GRP, My Sisa has a special interior layout, being the first with accommodation for 12 guests in a master, three VIP and two twin cabins. Another special feature is an elevator connecting all four decks, including the sundeck.